Recently Swipe company launched its new Smartphone with Swipe Senses with Fingerprint Reader. Through this phone Swipe comes with Fingerprint Reader scanner in phones below Rs. 10,000. Before this technology only comes in expensive phones more than RS.10,000. This phone will be available in the Indian market at Rs. 9,999 only. 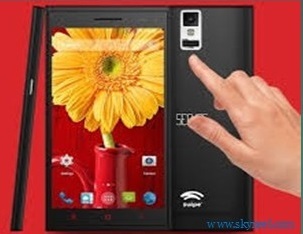 Swipe Sense is a Smartphone phone which is available in Dual SIM with 3G facility. Swipe sense is available in black color. This phone uses different chipsets for different variants in 3G versions with Quad-core 1.3GHz processor. It has 8 MP with auto focus, LED flash facility on rear and 3.2 MP front camera. The main highlight of this phone is Fingerprint Reader which is located just below the rear camera. Before Senses this high profile feature has come only in costly phones like Apple iphone 5s, Samsung Galaxy s5, HTC One, LG G3. Now this feature has come in main stream and other Smartphone companies will also launch their phone with this feature. Another highlight of this phone is additional battery. Company is providing additional battery in this phone in this phone box. User will get two batteries of power 2250 mAh with this phone. Swipe Sense Powered by Quad-core 1.3 GHz processor is used in this phone with 1GB RAM which will help in multitasking. This phone has 8GB ROM which can expand upto 32GB with the help of memory card. Display screen of this phone is 5.5 inches and resolution is of 540*960 pixels. It has capacitive touch screen which will be treat for big size screen likers. In this phone user will get 8 mega pixel rear camera and 3.2 mega pixel front camera. Swipe Sense runs on 4.4.2 Android Kitkat. It supports Java and browser flash. The Smartphone has a compass, Accelerometer, proximity and Maps, Calendar, Google Search, Gmail, YouTube, Google Talk, Alarm, Calculator, Clock, and other Google sync apps. This phone supports Wi-Fi, headphone, micro USB, dual sim, 2G and 3G connectivity options. This phone has battery of 2250 mAh. An additional battery also provided by company with this phone. This phone is available in black color. 1. Swipe Sense has high speed quad-core 1.3GHz processor. 2. Swipe Sense has good rear camera resolution. 3. Swipe Sense has FingerPrint Reader. 4. Swipe Sense has Additional Battery. 5. Swipe Sense has latest android OS 4.4.2 KitKat. 1. Swipe Sense has heavy weight.